This week there hasn't been enough time to knit. I know that seems like I wasn't trying hard enough, but it's true. I've had a lot of work stuff going on and a guest coming in to stay with us next week. (I still have cleaning to do for that...) Or maybe it's just been the past few days that I haven't had enough knitting time. Or maybe I'm knitting but because progress is so slow it feels like I haven't had enough knitting time. 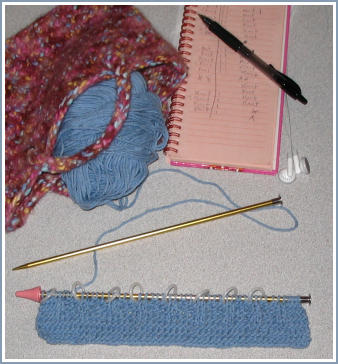 Or maybe making/playing with my blog options has kept me from knitting.... Either way I feel like I'm missing out on some critical knitting time. I choose a wash cloth to do as my first pattern project because it is small and unless I do something really tragic it will be useful in the end. In other news this morning I placed my first KnitPicks order. For about 20 minutes I thought I had found a 10% off coupon code. *sigh* I did, but it was from a few years ago and in my excitement I didn't notice the date until I went back to use it. Ah well. I still got my goodies, but 10% off would have been nice. I think you could handle a panta. Decreasing is easy. You knit or purl with two stitches rather than just one. Increasing is a bit harder and takes a little work to look okay from what I can tell. You knit or purl into the back of the stitch. Then into the front. I think a panta would be a great way for you to learn those two things without feeling like it's the end of the world if it's not perfect the first time.